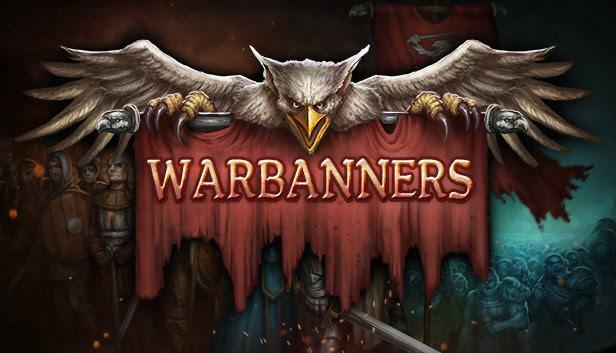 Warbanners, developed by Crasleen Games, is the latest game in a sub-genre I've covered a few times already this year: the turn-based tactical combat game in a medieval/fantasy setting. The game offers fast-paced, yet detailed combat with a very clear and responsive UI. 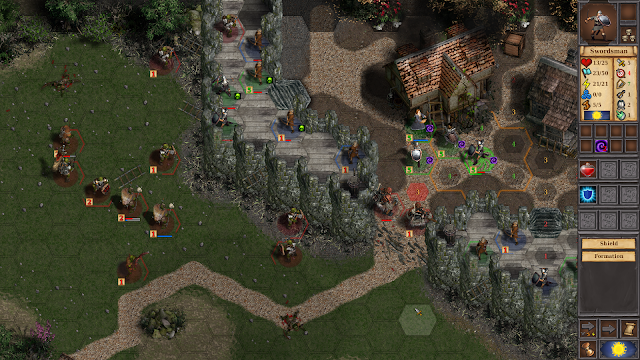 Outside of the combat, there is a light layer of RPG elements and party management to give context to the battles. There is nothing here that you haven't seen before, but it is all handled so competently that I think it is worth your time if you are into this kind of game. Now, let's dive into each section of the game in a bit more depth. 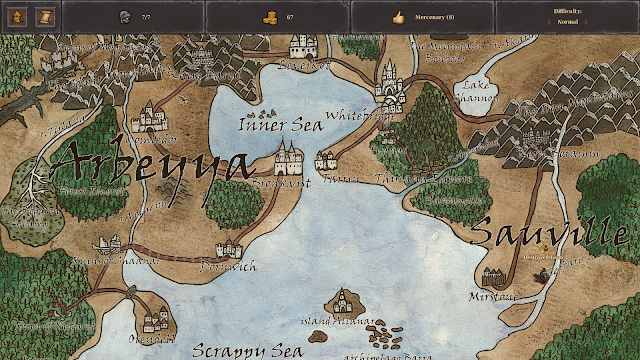 In the campaign, which consists of 42 linked scenarios (some optional), you command a small company of mercenaries, setting out to slay monsters and make some coin in the world. Unlike Battle Brothers, which focused on a sandbox world in the style of Mount & Blade, there is a linear story here, featuring your avatar Roderick. The story is the typical stuff of fantasy lore, there are necromancers raising undead, a mysterious cult, a war against orcs, elves feuding with dwarves, and so on, but it makes for good fluff to link the various missions together. You will often be given some kind of choice at a decision point in the story, and what you choose can change the shape of a coming battle, or have you avoid fighting at all. Many of these decisions will increase or decrease your "karma", which goes up as you do nice things, and down if you are a baddie. This doesn't change the game dramatically, but does lock away some options for your party if your alignment is one way or the other. The story moves along at brisk pace, and before you know it you will be caught up in the war against the orcs, which of course goes poorly for the humans and throws your party into some bad situations in the aftermath. I've not finished the whole campaign yet, but I think I'm about halfway through and can safely say that there is a good variety of mission types which force you to use different kinds of strategies. There are sieges, ambushes, desperate defensive stands and all out large scale battles where you have many allies and foes. Managing your company consists of buying potions, equipping gear as it becomes available, and leveling up your experienced troopers. At the start you only have basic swordsmen and archers, along with your leader, but soon you gain access to additional fantasy archetypes. Dancers (basically rogues), mages, healers, knights, and so on. As you add in these more interesting classes, their abilities add much more complexity to the battlefield since they all have multiple special abilities and traits. The dancer, for example, gets bonus to flanking attacks and ignores enemy zones-of-control when moving. She can zip behind the enemy line and stab them in the back, inflicting bleeding damage as she goes and even has a limited ranged attack when needed. However, in return for all those perks, she has less health and can't take many hits. As units level up, you can choose one stat boost from among three random options, so no two swordsmen will be the same after a few outings. Units can also gain new perks and abilities at higher levels. Another way to make a unit special is to give it one of the unique pieces of gear that are awarded after some missions. There are boots which can make a swordsman move like a dancer, a bow that increases an archer's range, and an item that lets a character attack in a 3-tile arc with each swing. 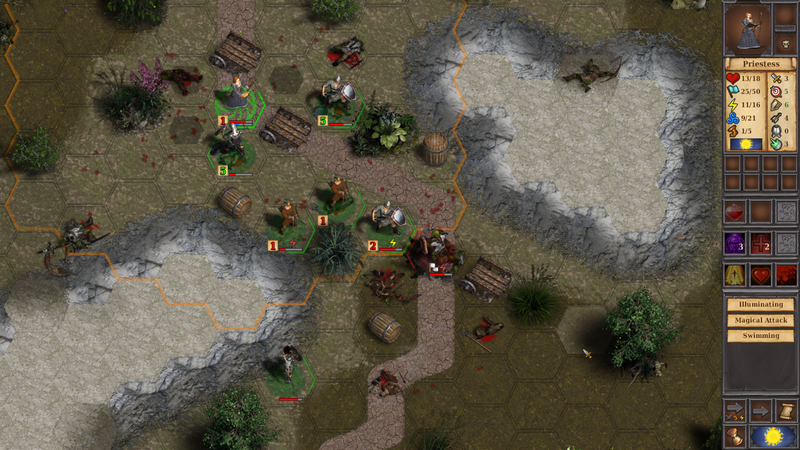 Tactics play an important role in winning battles without losing a lot of units. Long term success in the campaign is much more assured if you can avoid losing any of your units in a battle. If they die, they must either be replaced with a fresh, level one newbie, or resurrected at a higher cost. Spending a lot of your limited cash on resurrections means that you won't be able to buy many potions, which are very helpful in certain situations, or hire the "assistants" which are essentially permanent buffs of various types. These assistants are people you hire to augment your mercenary band, but who don't actually fight on the battlefield. They do things like boost morale, unlock additional classes, or even give you a game-changing catapult in every mission. They are expensive but quite useful and you want to accumulate as many as you can afford. There isn't any way to get extra cash outside of completing missions, so for the entire campaign you are working with a very finite budget. As you might expect, your forces are often outnumbered, so you will need to use the terrain to your advantage, creating choke points and kill zones when possible. Most every mission has the ultimate goal of killing every single enemy on the map, but how you go about that can differ a great deal depending on the circumstance and how you have built your army. I often used a tactic of holding a defensive line in one section of the battle, while punching through somewhere else and getting behind the strongest part of the enemy line. Potions, as I mentioned before, are very useful in this game and can help turn the tide of a fight. There are about a dozen different types, besides just health and mana potions. You can stun enemies, poison them, freeze them, or use other potions to buff your own soldiers. These potions cost cash, so you can't use them willy-nilly, but you will absolutely need them at times. One particular case was when I went up against the "boss" orc in a large battle. He was unstoppable in a straight up fight, able to kill multiple units in one turn, but toss a few potions at him and you can hobble him long enough to get in some attacks and wear him down. Attack an enemy enough times and you can exhaust their stamina, which means even the nastiest warrior can't do anything on their turn. Every unit also has a morale value which goes up and down depending on how the battle is going, and other factors. Get an enemy to rout and they will be easy pickings. All of this is tied together with a clean and efficient UI. 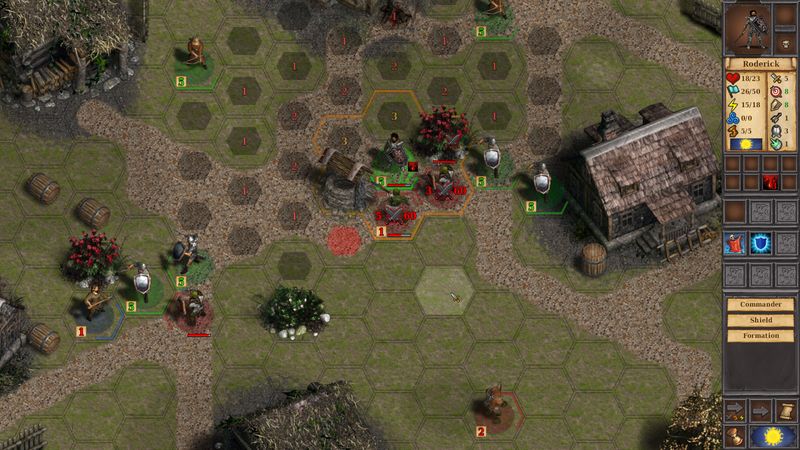 When a unit is selected, all the hexes it can move to are highlighted, when colored numbers showing whether a unit will still be able to attack after they reach that destination. Unit stats and special abilities appear on the sidebar, along with any consumable items like potions they are carrying. It's all very straightforward, but works well and quickly. I really enjoyed the time I spent with Warbanners, and fully plan on going back and finishing the campaign even after I write this review. It's simply a good crunchy tactical strategy game that doesn't demand too much of your time to have a satisfying play session. I fully recommend this game to anyone looking for a solid tactical combat game with a classic fantasy theme. Warbanners is available on Steam.